“And true virtue is what critics cannot help but acknowledge” goes the popular adage. A case in point is where the renowned Orientalist Aloys Sprenger (d. 1893 CE) humbles his pen to write, “There is no nation, nor has there been any which like them [Muslims] has during twelve centuries recorded the life of every man of letters.” The exclusivity of Muslims vis-à-vis the isnād system, as explained earlier, lies in their detailed evaluations of the transmitters who form the chains of transmission, better known as al-Jarh wa al-Ta‘dīl (lit. criticism and accreditation). In this article, we will briefly outline the origins and development, basic nomenclature, procedures, and relevant literature in the science of al-Jarh wa al-Ta‘dīl (henceforth narrator criticism). To ensure the accurate transmission of the Prophet’s teachings, the science of narrator criticism inherently involves an exposition of a narrator’s personal details. Disclosing a narrator’s faults for a greater need can be justified by verses from the Qur’ān, the practice of the Prophet (peace and blessings be upon him), and the higher objectives of Islamic law. Since this permission was granted as an exception, it is limited to disclosing relevant information that has a direct bearing on transmission. Consequently, when a narrator’s status can be made apparent by highlighting one flaw, it is unlawful to mention a second. Narrator criticism began early in Islamic history. Among the Companions, the names of ‘Umar, ‘Alī, Ibn ‘Abbās, and ‘A’ishah (Allāh be pleased with them) feature prominently among the first group of narrator critics. This practice was then inherited by the subsequent generation of senior Successors, such as Sa‘īd ibn al-Musayyab (d. 94 AH), ‘Amir al-Sha‘bī (d. 103 AH), and Ibn Sīrīn (d. 110 AH). Like other Islamic disciplines, the material on narrator criticism during the first century is fairly minimal. This owes itself to the fact that transmitters at the time were either Companions, who were collectively upright, or senior Successors, among whom were relatively few impugned transmitters. Scholars after al-Rāzī expounded and built upon his categorization, such as Ibn al-Salāh (d. 643 AH), al-Dhahabī (d. 748 AH), al-‘Irāqī (d. 806 AH), Ibn Hajar (d. 852 AH), al-Sakhāwī (d. 902),  and al-Suyūtī (d. 911 AH). The evaluations of these critics were documented in various books for scholarly reference. The porosopograpical literature is vast—based on regions, schools of thought, field of study, etc.—and deserves an independent study. For the purpose of the present article, we can categorize the biographical works of narrator criticism into three broad categories: reliable transmitters, weak transmitters, and a combination of both groups. Extant literature on reliable transmitters include Ibn Hibbān’s (d. 354 AH) al-Thiqāt and Ibn Shāhīn’s (d. 385 AH) Tārīkh Asmā’ al-Thiqāt. Extant literature on weak transmitters include al-Bukhārī’s al-Du‘afā’ al-Saghīr, Ibn Hibbān’s al-Majrūhīn and Ibn ‘Adī’s (d. 365) al-Kāmil fī Du‘afā’ al-Rijāl. Extant literature that comprises transmitters of both groups include al-Bukhārī’s al-Tārīkh al-Kabīr and Ibn Abī Hātim al-Rāzī’s (d. 327 AH) al-Jarh wa al-Ta‘dīl. A rich resource for narrator evaluations is the su’ālāt genre (Q&A), which have contributions from leading authorities like Yahyā ibn Ma‘īn and ‘Alī ibn al-Madīnī (d. 234 AH). Al-‘Askarī, Dīwān al-Ma‘ānī, vol.1, p.72. Sprenger, Forward to A Biographical Dictionary of Persons Who Knew Mohammad, vol.1, p.1. He then writes, “If the biographical records of the Musalmans were collected, we should probably have accounts of the lives of half a million of distinguished persons, and it would be found that there is not a decennium of their history, nor a place of importance which has not its representatives.” There is a degree of exaggeration in these figures, but there is no doubt that the Muslim civilization is peerless in this accomplishment. See: Abū Ghuddah, Lamahāt, p.163. Imāms al-Ghazālī (d. 505 AH) and al-Nawawī (d. 676 AH) explain six instances where speaking about the faults of others is lawful and at times even necessary. The fourth instance is to caution others from the evils of an individual, which includes narrator criticism. See: al-Ghazālī, Ihyā’ ‘Ulūm al-Dīn, vol.3, pp.152-153; al-Nawawī, Riyād al-Sālihīn, pp.425-426. Such as the verse, “O you who believe, if a wicked person brings you any news, examine it carefully, lest you should harm some people in ignorance and afterwards you may have to repent for what you did” [Surat al-Hujurāt, verse 6]. Al-Baghdādī, al-Kifāyah, p.35; Ibn al-Salāh, Ma‘rifat Anwā‘ ‘Ilm al-Hadīth, p.389; al-Suyūtī, Tadrīb al-Rāwī, vol.5, pp.543-544; al-‘Umarī, Buhūth fī Tārīkh al-Sunnah al-Musharrafah, pp.91-92. For instance, once while seated with his companions, he cautioned them of someone by saying, “What a miserable member of the community.” See: al-Bukhārī, al-Jāmi‘ al-Musnad al-Sahīh, vol.8, p.13. Al-Lāhim, al-Jarh wa al-Ta‘dīl, pp.30-31, pp.34-39; al-Baghdādī, al-Kifāyah, p.37 ff. Al-Laknawī, al-Raf‘ wa al-Takmīl, p.11 ff. Al-Sakhāwī, Fath al-Mughīth, vol.4, p.359. In a treatise entitled “Dhikr Man Yu‘tamad Qawluhū fi al-Jarh wa al-Ta‘dīl,” al-Dhahabī lists the narrator critics beginning from the end of the Companion’s age until his day. Notwithstanding his omission of a number of key figures, he managed to gather the names of 715 critics dividing them into 22 classes. In his seminal work al-I‘lān bī al-Tawbīkh, al-Sakhāwī summarized the above treatise and added names of scholars until his day; a total of 210 figures. See: al-Sakhāwī, al-I‘lān bī al-Tawbīkh, p.320 ff. Both lists can be found in the four treatise collection “Arba‘ Rasā’il fī ‘Ulūm al-Hadīth” of Shaykh ‘Abd al-Fattāh Abū Ghuddah. Tāj al-Dīn al-Subkī (d. 771 AH) enumerates the prolific memorizers (huffāż), starting with Abū Bakr (Allāh be pleased with him) and concluding with al-‘Alā’ī (d. 761 AH); a total of 212 figures. See: al-Subkī, Tabaqāt al-Shāfi‘iyyah al-Kubrā, vol.1, pp.314-318. Note that none of these lists were intended to be exhaustive. See: Abū Ghuddah, Preface to Dhkir Man Yu‘tamad Qawluhū, pp.163-166. For a list of names that could have been added, see: Abū Guddah, Preface to al-Mutakallimūn fī al-Rijāl, p.84-85. Another beneficial read is Scott Lucas’ analyses of seven lists and three tabaqāt presentations of Hadīth critics. See: Lucas, Constructive Critics, pp.113-126. For reports on their narrator criticism, see: Ibn ‘Adī, al-Kāmil fī Du‘afā’ al-Rijāl, pp.166-171. Ibn ‘Adī further mentions the names of ‘Abd Allāh ibn Salām, ‘Ubādah ibn al-Sāmit, and Anas ibn Mālik. When reading these reports, it is important to note that the word ‘khadhaba,’ which generally means to lie, can also mean to err. See: Ibn Manżūr, Lisān al-‘Arab, vol.1, 709; al-Zabīdī, Tāj al-‘Arūs, vol.4, p.129. Al-Hākim mentions the following four Companions: Abū Bakr, ‘Umar, ‘Alī, and Zayd ibn Thābit. See: al-Hākim, Ma‘rifat ‘Ulūm al-Hadīth, p.52. On the vowelization of al-Musayyab, see: Ibn Khallikān, Wafayāt al-A‘yān, vol.2, p.378; al-Nawawī, Tahdhīb al-Asmā’ wa al-Lughāt, vol.1, p.219. Ibn ‘Adī, al-Kāmil fī Du‘afā’ al-Rijāl, pp.172, 177, 179. Ibn ‘Adī goes on to enumerate a number of others from this generation. Ibn Rajab al-Hanbalī writes that the first narrator critic was Ibn Sīrīn (Sharh ‘Ilal al-Tirmidhī, vol.1 p.355) while al-Dhahabī writes that it was al-Sha‘bī (Dhikr man Yu‘tamad, p.172). Since these critics were all working around the same time, it is understandable why later scholars would arrive at different conclusions. Nevertheless, this difference is in respect to those who proceeded the Companions, as al-Dhahabī explains. Al-Dhahabī, Dhikr Man Yu‘tamad Qawluhū, p.173; al-Sakhāwī, al-I‘lān bī al-Tawbīkh, p.320. This should not lead one to think that the era of the Successors was void of weak transmitters. Yes, there were unreliable narrators, but they were few in comparison to subsequent generations. By way of illustration, we can look at al-Bukhārī’s book on weak transmitters entitled “al-Du‘afā’ al-Saghīr.“ From a total of 418 entries, he included only 79 Successor entries—that is, 19%—keeping in mind that most of these entries are for junior Successors. See: al-Hasanī, Ma‘rifat Madār al-Isnād, vol.1, pp.385-388. Al-Dhahabī, Dhikr Man Yu‘tamad Qawluhū, p.175; al-Sakhāwī, al-I‘lān bī al-Tawbīkh, p.320. A quadripartite narrator categorization supposedly formulated by ‘Alī ibn Abī Tālib goes as follows: ‘Alī was asked about the hadiths of innovation and contradictory reports in circulation, so he replied, “Indeed people are in possession of [the following types of reports] truth and falsehood, abrogator and abrogated, general and specific, perspicuous and intricate, and preserved and flawed.” After stating that fabrication began during the Prophet’s lifetime, ‘Alī mentions four categories of narrators: (1) a Hypocrite who knowingly lies about the Prophet (2) one who heard the Prophet but did not retain properly and therefore erred (3) one who heard a ruling from the Prophet but did not hear the later abrogation (4) one who does not lie about Allah or His Prophet and retained what he heard properly. He then says that the words of the Prophet were sometimes misunderstood by the listener, and that the Companions would anticipate for villagers to come and ask the Prophet so they can also benefit. See: al-Sharīf, Nahj al-Balāghah, p.229-231; al-Qāsimī, Qawā‘id al-Tahdīth, p.162. There are problems with both the transmission and content of this report. First, it features in Nahj al-Balāghah, a collection of sayings attributed to ‘Alī ibn Abī Tālib. Either ‘Alī ibn al-Husayn al-Murtadā (d. 436 AH) or his brother Muhammad ibn al-Husayn al-Radī (d. 406 AH) is accused of fabricating the reports found therein. Regardless of who compiled the book, as al-Dhahabī explains, the problematic content is sufficient proof to negate its attribution to ‘Alī. See: al-Dhahabī, Mīzān al-I‘tidāl, vol.3, p.124, no.5827; Siyar A‘lām al-Nubalā’, vol.17, pp.286/589. Second, Rashīd Ridā (d. 1935 AH) mentions eight reasons why the content of this report is flawed. For instance, there is a clear anachronistic usage of technical terms (e.g. naskh, ‘ām, and muhkam). Furthermore, this is obviously a partisan attempt to cast doubt on the integrity of majority of the Companions. See: Ridā, al-Manār, vol.34, pp.621-624. It is worth adding that the tripartite classification cited on the authority of ‘Ali in Usūl al-Shāshī, a Hanafī primer on legal theory, appears to be a paraphrase of the above report. See: al-Shāshī, Usūl al-Shāshī, pp.422-423. Muslim, al-Tamyīz, p.179. As a side note, the title of the given reference is al-Tamyīz (lit. to distinguish) because the author distinguishes therein errors from accurate transmission. See: al-Hasanī, Ma‘rifat Madār al-Isnād, vol.1, p.65. Muslim, Introduction to al-Musnad al-Sahīh, pp.5-7. His tripartite classification is: (1) reliable transmitters in whose transmission there is no severe disagreement (2) a lower class who are of virtue and truthful, but are not recognized with outstanding memory and precision (3) accused transmitters and those whose narrations for the most part are detestable or errors. See: al-Lāhim, al-Jarh wa al-Ta‘dīl, p.292. For an important clarification on this categorization, see: ‘Awwāmah, Preface to Musannaf Ibn Abī Shaybah, vol.1, pp.102-105/Dirāsāt al-Kāshif, pp.188-192. In al-Tamyīz, Muslim speaks of three types of narrators in respect to memorization: (1) the prolific memorizer whose memory is brilliant and who avoids what is to be avoided (2) the lax transmitter whose memory fails— by erring or faltering in response to altered hadiths (talqīn) (3) whose focus is memorizing hadith texts without their chains of transmission thereby being negligent in memorizing the tradition; he errs thereafter by attributing them to the incorrect source. See: Muslim, al-Tamyīz, p.170. See: Ibn Rajab al-Hanbalī, Sharh ‘Ilal al-Tirmidhī, vol.1, pp.396, 435. Al-Lāhim, al-Jarh wa al-Ta‘dīl, pp.291-293. Al-‘Umarī, Buhūth, pp.95-96; al-‘Awnī, al-Manhaj al-Muqtarah, p.246 ff. For an important clarification on Ibn Ma‘īn’s usage of this phrase, see: ‘Awwāmah, Dirāsāt al-Kāshif, pp.70-72. Ibn al-Salāh, Ma‘rifat Anwā‘ ‘Ilm al-Hadīth, p.121; al-Lāhim, al-Jarh wa al-Ta‘dīl, p.290, 294. Al-Rāzī, al-Jarh wa al-Ta‘dīl, vol.2, p.32. By placing a number of terms in one category does not necessitate that they are equal in indication. For example, the terms thiqah and mutqin are placed in one category, but are not equal. See: ‘Awwāmah, Footnotes on Tadrīb al-Rāwī, vol.4, pp.178-179. He substantiates the categorization of these expressions from a report where ‘Abd al-Rahmān ibn Mahdī is asked, “Is Abū Khaldah reliable?” and he replies, “He is truthful and trustworthy, but Sufyān and Shu‘bah are reliable.” See: al-Rāzī, al-Jarh wa al-Ta‘dīl, vol.2, p.37. See footnote no.1 in: al-Lāhim, al-Jarh wa al-Ta‘dīl, p.295. Ibn al-Salāh, Ma‘rifat Anwā‘ ‘Ilm al-Hadīth, pp.121-127. Al-Dhahabī, Mizān al-I‘tidāl, vol.1, p.4. Ibn Hajar, Nuzhat al-Nażar, pp.133-134. It should be noted that the six class categorization outlined in the introduction to his al-Taqrīb is specific to that book and should not be extended elsewhere. See: ‘Awwāmah, Introduction to al-Taqrīb, p.26. Al-Sakhāwī, Fath al-Mughīth, vol.2, p.277. Al-Suyūtī, Tadrīb al-Rāwī, vol.4, pp.181-202. See: al-Lāhim, al-Jarh wa al-Ta‘dīl, pp.295-296; al-Laknawī, al-Raf‘ wa al-Takmīl, pp.129 f.
 Abū Ghuddah, Lamahāt min Tārīkh al-Sunnah wa ‘Ulūm al-Hadīth, p.84. Al-A‘żamī, Manhaj al-Naqd ‘ind al-Muhaddithīn, p.20. See: al-Lāhim, al-Jarh wa al-Ta‘dīl, pp.43, 47, 62, 77. See, for instance, Ibn Ma‘īn, Ma‘rifat al-Rijāl, vol.1, p.66/ vol.2, p.31. Al-‘Uqaylī, Kitāb al-Du‘afā’, vol.3, p.30. Al-Dhahabī said, “He is a liar if he did this intentionally. But if he was confused with ‘Atā’ ibn al-Sā’ib, he will be abandoned for poor memory.” See: al-Dhahabī, Mizān al-I‘tidāl, vol.2, p.360. For another example, see: al-Bagdādī, Tārīkh Baghdād, vol.8, p.184. On the usage of this form of examination, see: al-Sakhāwī, Fath al-Mughīth, vol.2, pp.137-140. Ibn Hajar writes that it is permissible to shuffle the chain or text of a hadith to examine a narrator on condition that it is done only for the required time. See: Ibn Hajar, Nuzhat al-Nażar, p.96. See the example of Thābit al-Bunānī in: al-Rāzī, al-Jarh wa al-Ta‘dīl, vol.2, p.449. Shu‘bah ibn al-Hajjāj had a habit of testing narrators in this manner. See: Ibn Hajar, al-Nukat, vol.2, p.866. While describing the 33rd chapter of his book Ma‘rifat ‘Ulūm al-Hadīth, al-Hākim writes, “This chapter pertains to hadith discussions and distinguishing thereby. And through discussions a truthful narrator can be recognized from one who is not, because a person who is reckless during [hadīth] discussions will be reckless in narrating hadīths.” See: al-Hākim, Ma‘rifat ‘Ulūm al-Hadīth, p.140. Ibn Hibbān, al-Majrūhīn, vol.2, p.394. Abū Zur‘ah, Kitāb al-Du‘afā’ (As’ilat al-Bardha‘ī), vol.2, p.409. Also see: al-Baghdādī, Tārīkh Baghdād, vol.14, p.307. Al-‘Umarī, Buhūth fī Tārīkh al-Sunnah al-Musharrafah, p.99. Ahmad al-‘Ijlī’s (d. 261 AH) work, famously known as al-Thiqāt, is not specific to reliable transmitters contrary to what the popular title would have its readers assume. The correct title of the book, in light of a sixth century manuscript and quotes from authoritative scholars, is “al-Tārīkh.” See: al-‘Awnī, al-‘Unwān al-Sahīh li al-Kitāb, pp.71-74. It appears that Ibn Hibbān incorporated majority, if not all, of the entries of al-Bukhārī’s al-Tārīkh al-Kabīr into both his al-Thiqāt and al-Majrūhīn. See: al-‘Arabī, al-Farā’id ‘alā Majma‘ al-Zawā’id, pp.92, 256. Early literature on the Tārīkh genre was predominantly based on occurrences (e.g. al-Tabarī’s Tārīkh) and less so on entries (e.g. al-Bukhārī’s Tārīkh). During the sixth century, however, there was a shift in interest and the Tārīkh genre began to see a new trend of working with entries; perhaps an influence from Hadīth studies. See: Ma‘rūf, Introduction to Tārīkh al-Islām, p.89. Shaykh ‘Abd Allāh al-Ghumārī states that Ibn Hibbān authored two distinct works on unreliable transmitters, al-Majrūhīn, which is easily accessible, and al-Du‘afā’. He owned a copy of al-Du‘afā’, which varied completely from the other work, in his personal library until it got lost while mailing it to his brother Ahmad. See: ‘Awwāmah, Footnotes on Tadrīb al-Rāwī, vol.3, p.82. Al-Dhahabī used al-Kāmil as a foundation for Mizān al-I‘tidāl, which in turn formed the basis of Ibn Hajar’s Lisān al-Mīzān. Ibn Hajar incorporated an addendum to Mizān al-I‘tidāl authored by his teacher al-‘Irāqī. And Shaykh Hātim al-‘Awnī further authored a useful addendum to Lisān al-Mīzān. Al-Bukhārī’s book should not be understood as a conventional work on narrator criticism. Yes, he evaluates a small number of transmitters by the way, but overall it is only a biographical dictionary. This can be seen from the correct title of the book “al-Tabaqāt wa al-Tārīkh” as mentioned by al-‘Askarī (d. 382 AH). See: ‘Awwāmah, Footnotes on Tadrīb al-Rāwī, vol.5, p.542/Majālis fi Qawlihī Ta‘ālā, p.229; al-‘Askarī, Tashīfāt al-Muhaddithīn vol.1, p.116/vol.2, p.629. Contrast this with Shaykh ‘Abd al-Rahmān al-Mu‘allimī’s observation, “It is al-Bukhārī’s practice to cite a report in al-Tārīkh only to demonstrate the weakness of its transmitter.” See: al-Mu‘allimī, Footnotes on al-Fawā’id al-Majmū‘ah, p.180; cf. al-‘Arabī, al-Farā’id ‘alā Majma‘ al-Zawā’id, p.65. Also see the comment attributed to al-Bukhārī in: al-Mizzī, Tahdhīb al-Kamāl, vol.18, p.265; cf. al-Dirīs, al-Hadīth al-Hasan, vol.1, pp.406-415. On al-Rāzī’s book, see al-Mu‘allimī’s preface, section tā onwards; al-‘Umarī, Buhūth, p.151; Dickinson, The Development of Early Sunnite Criticism, p.30. For instance, Su’ālāt Ibn al-Junayd li Yahyā ibn Ma‘īn. For instance, Su’ālāt Ibn Abī Shaybah li ‘Alī Ibn al-Madīnī. See: al-Juday‘, Tahrīr ‘Ulūm al-Hadīth, pp.525-527. In view of the stringent conditions to qualify for narrator criticism, it is no wonder that the number of expert critics are so few. See: al-Biqā‘ī, al-Nukat al-Wafiyyah, vol.1, p.290. 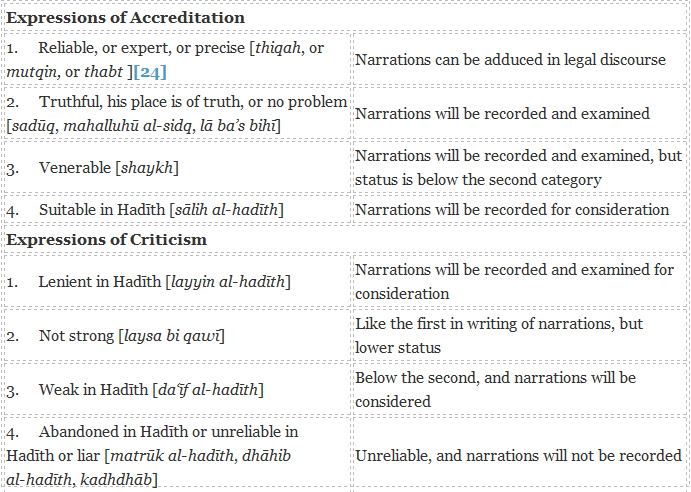 Al-Dhahabī places narrator critics into three classes: (1) staunch in criticism and rigorous in accreditation [accreditation from this class will be readily accepted while their criticism will require corroboration] (2) lenient (3) balanced. He simultaneously cites examples of each class. See: al-Dhahabī, Dhikr Man Yu‘tamad, p.172; al-Laknawī, al-Raf‘ wa al-Takmīl, p.122. This can be an outcome of factors like being contemporaries, personal disagreement, and conflicting theological or jurisprudential views. Tāj al-Dīn al-Subkī offers a unique treatment of the subject in Tabaqāt al-Shāfi‘iyyah al-Kubrā (vol.2, p.9), drawing in part from Ibn ‘Abd al-Barr’s Jāmi‘ Bayān al-‘Ilm wa Fadlihī (vol.1 pp.1187 ff.). al-Subkī’s section was later published separately by Shaykh ‘Abd al-Fattāh Abū Ghuddah in Arba‘ Rasā’il fī ‘Ulūm al-Hadīth (p.19), as usual with beneficial footnotes. Also see: Ibn Daqīq al-‘Id, al-Iqtirāh fī Bayān al-Istilāh, p.436 f.; Abū Ghuddah, Mas’alat Khalq al-Qur’ān wa Atharuhā fī Sufūf al-Ruwwāh wa al-Muhaddithīn wa Kutub al-Jarh wa al-Ta‘dīl [cf. Lucas, Constructive Critics, pp.198-201]. See: al-Baghdādī, Sharaf Ashāb al-Hadīth, p.41; cf. Ibn al-Wazīr, al-‘Awāsim wa al-Qawāsim, vol.2, p.399. See: Ibn Hibbān, al-Majrūhīn, vol.1, p.507. See: al-‘Ijlī, al-Tārīkh, vol.1, p.20. On the statement of Abū Dāwūd, “My son ‘Abd Allāh is a liar,” see: al-Mu‘allimī, al-Tankīl, vol.2, p.516 ff. Al-‘Ijlī, al-Tārīkh, vol.1, p.336; ‘Awwāmah, Adab al-Ikhtilāf, p.104; al-Nadwī, Sulaymān, Tahqīq Ma‘nā al-Sunnah, pp.116-117.